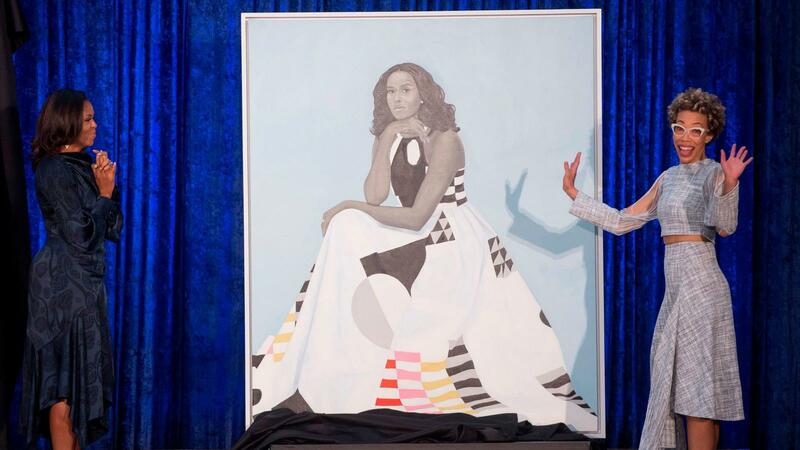 Amy Sherald's distinctive portrait of Michelle Obama was unveiled last month at the Smithsonian's National Portrait Gallery, and it's been a huge hit ever since. So many visitors have been clamoring to get a glimpse of the First Lady in Sherald's distinctive style, that the museum has moved the artwork to accomodate more guests. "We're always changing things up here. Due to the high volume of visitors, we've relocated Michelle Obama's portrait to the 3rd floor in our 20th-Century Americans galleries for a more spacious viewing experience," a tweet from the museum explains. 176,700 people visited the National Portrait Gallery in February 2018. In 2017, the gallery averaged about 108,000 visitors a month, according to their visitor data. Sherald, a Baltimore-resident, is the first Black woman to paint an official presidential portrait.